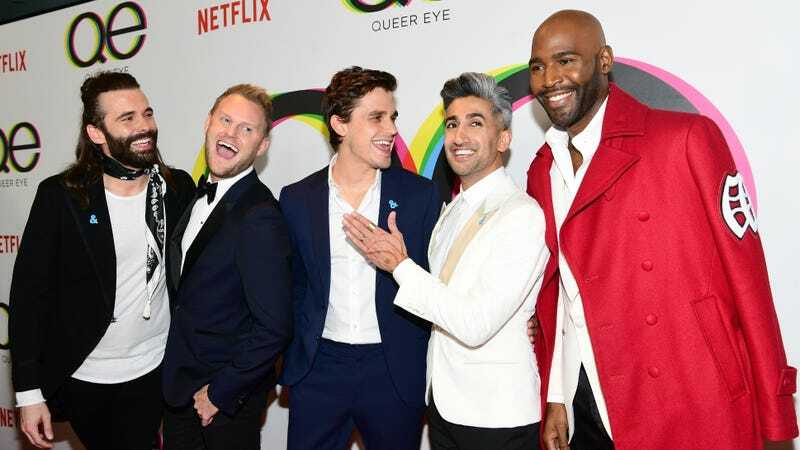 Queer Eye, the delightful Netflix reboot that warmed the icy heart of America, is coming back June 15 for a second season. According to this tidbit from Entertainment Weekly’s cover story on the Fab Five, the second season was filmed at the same time as the first and will feature the men breaking tradition, adjusting the show for 2018, and including its first trans contestants. There will be tears. There will be “food.” But most important, there will be understanding and positivity—nice things we could all use in measured doses. To answer your hashtag, Jonathan, I cannot! What foods will Antoni cook that are not grilled cheese and grapefruit with avocado? Has he considered a nice Bolognese? What about a roast chicken? A slice and bake cookie, maybe? Will Tan dress a man in a short sleeved shirt, but buttoned instead of left open? Can Jonathan have his own episode? Will Karamo do more than just provide gentle advice and listen? Even if the answer to the previous question is “yes,” do you have proof? Queer Eye&apos;s Redneck Margarita Guy Is Engaged to His Ex, But Is It All Just a Publicity Stunt?